V1947. 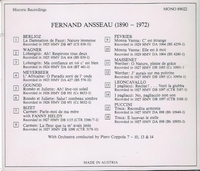 FERNAND ANSSEAU: Arias from Roméo, Werther, Monna Vanna, La Damnation de Faust, L’Africaine, Carmen, Pagliacci, Tosca & Lohengrin; w.Fanny Heldy: Carmen – Parle-moi de ma mère. (Austria) Preiser 89022, recorded 1923-29. Final copy!